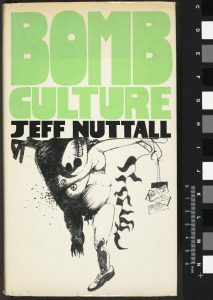 Jeff Nuttall arrived in Leeds at the dawn of the 1970s, already well known as an artist, musician, publisher, and teacher, an established poet featured in Penguin’s Modern Poets series in 1968, and author of Bomb Culture in the same year. 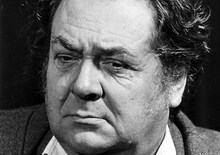 Born in Clitheroe, Lancashire in 1933, and brought up in Herefordshire, after graduating from art college he completed his National Service in the Royal Army Education Corps before becoming involved in the late 1950s London jazz scene and the early activities of CND, joining the Aldermaston marches. He worked as a secondary school art teacher and simultaneously pursued a career in the artistic and literary avant-garde. 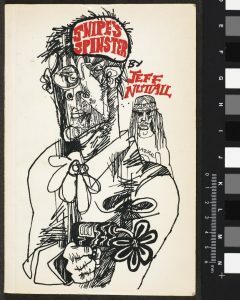 As a pioneer of ‘happenings’ and performance art, co-founder of the People Show experimental theatre company, an admirer of William Burroughs – who collaborated on Nuttall’s self-published periodical My Own Mag – and prolific contributor to underground magazines, he became a notable (counter-)cultural figure in 1960s London. Nuttall had been a lecturer at Bradford School of Art immediately prior to taking up his post at Leeds, where he joined the staff of the Fine Art Department at the recently-founded Polytechnic during a particularly fertile time for the arts. The UK’s art education system had undergone radical changes in the 1960s, with contemporary artists employed to re-define teaching methods and practise; the introduction of the Basic Design Course at the highly-regarded College of Art put Leeds at the forefront of this shift. When that institution was merged with the Polytechnic to create a Fine Art Department, under the leadership of Willy Tirr, Leeds quickly built on its existing reputation for artistic experimentation. This often took challenging or controversial forms, in which Nuttall played a prominent role, urging the pushing of boundaries. Like his contemporary, poet Martin Bell, Nuttall was brought in as an author and practising artist to enhance the creative atmosphere and provide a genuine cultural presence, as much as to undertake formal teaching duties. With an irreverent attitude toward authority, he shared with Bell a fondness for conducting spontaneous seminars in pubs close to the Polytechnic and University – usually the Cobourg, Eldon or Fenton. 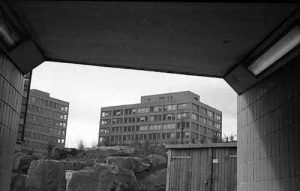 Leeds Polytechnic buildings from an underpass, 1970s ©Leeds Library and Information Service, courtesy of Stephen Howden. Courtesy of the Jeff Nuttall Estate and The University of Manchester. Time-clock severity, Armley gallows (drop on the last chime). There is currently a retrospective exhibition, Off Beat: Jeff Nuttall and the International Underground, concentrating on his counter-cultural connections in the 1960s, at the University of Manchester’s John Rylands Library, which runs until March 2017. The Rosie Effect. Review by Jess Haigh and Competition Give Away. Previous story Losing Juliet Author June Taylor Gives Her Top Five Editing Tips. Plus Five From Her Editor.